Bike Spanner is one of our longest serving clients, we made them their (and ours) first website in 2001! Since then Bike Spanner (formally Real Cycles) has been through many changes and we've been right there with them, adapting and improving the website to keep it on-trend and up to date with modern standards. In 2018 the original owner retired from the bike trade and the new owners retained our services to take the website into 2019 and beyond. 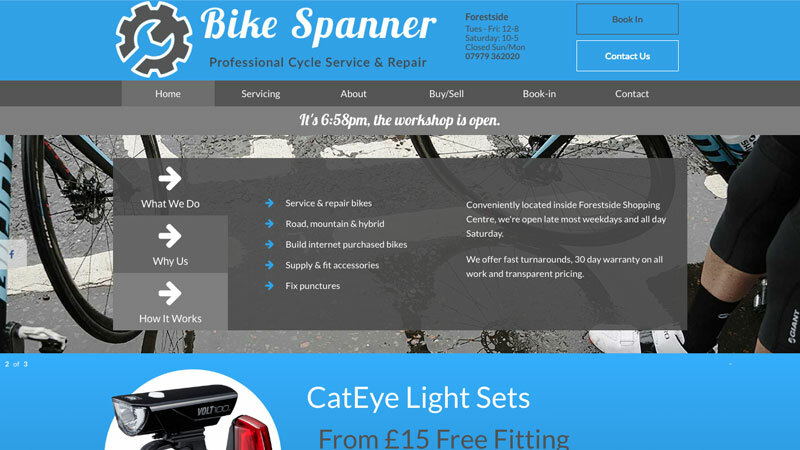 The bike spanner website is based on our popualr Workshop Website CMS platform and uses the equipment hire add-on to manage their bike box hire facility. Under the new owners the website has been streamlined, removing many additional features to re-focus on the repairs and hire business. We maintain the site on an ongoing basis.